Allview reveals new details of the X6 series. The upcoming X6 range will include three models: Xtreme, Vision and Mini. We hereby notify you that S.C. Visual Fan S.R.L. may collect any information about your person, through any type of identifiers such as name, identification number, location data, online identifier or one or more specific elements of your physical or social identity; To continue browsing the ALLVIEW website, please check the box "Accept". After participating in the MWC 2019, where the future X6 Xtreme flagship was presented, Allview reveals additional details about the upcoming X6 series. According to the Romanian manufacturer, it will include three smartphones, specially designed for the most versatile usage needs, with features and prices that rival the best-rated devices of the moment. "We're getting closer to finishing up the last touches for the new X6 series, which will include three devices designed to cover various users demands, as well as the latest technology and industry trends. If X6 Xtreme surprised by the unparalleled choice of not integrating the frontal camera into the display, X6 Vision with built-in projector will bring an essential upgrade to support users who want to mix professional and daily activities, no matter where they are. At the same time, the entire X6 series will run on Android ™ 9.0, Pie for efficient energy use, but also for a better user experience predictability. ", stated Lucian Peticila, Allview CEO. X6 Xtreme, already featured in Barcelona, will include a full view screen, a 16MP AF f / 1.8 + 5MP FF dual camera and will be supported by a state-of-the-art processor, MediaTek Helio P70 and a 4GB RAM memory. X6 Vision will receive a memory upgrade compared to the previous X4 Vision, to 6GB RAM, with a 5.99" 18:9 FHD+ display and an Octa Core Helio P23 processor. The built-in MEMS laser projector will turn the smartphone into an ideal device for both business and leisure, with a projection of up to 5 meters in diagonal. 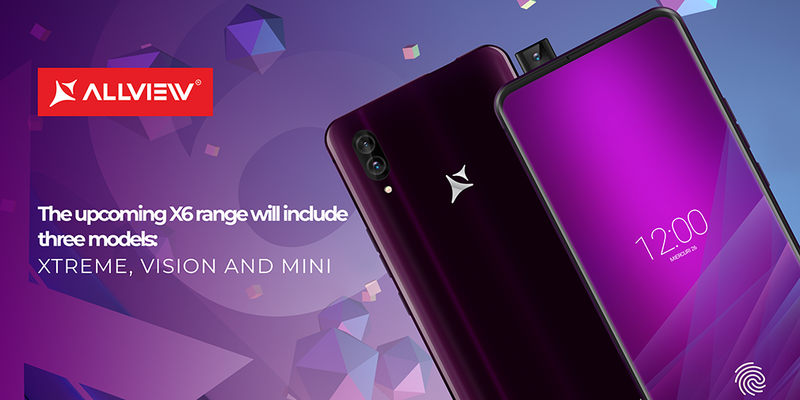 At the same time, X6 Mini, the most affordable device from the range in terms of budget, will integrate a 13+2MP dual camera and a 13MP selfie camera, and will be available in a special color for users who want to stand out. The terminal will run Android™ 9.0, Pie using artificial intelligence for customized user experiences, as the device "learns" the user’s preferences. The terminals will be launched between April and May 2019.